Here's another of those jobs that I had the pleasure of experiencing with someone else. In this case Enrique and Monte Vega. My contribution was the sections of the rail with the forged scroll cap. 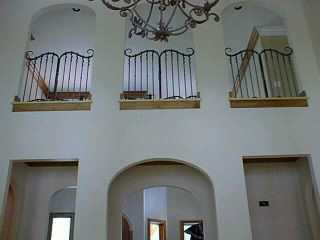 Another angle of the installed rail. This is at the top of the stairs. 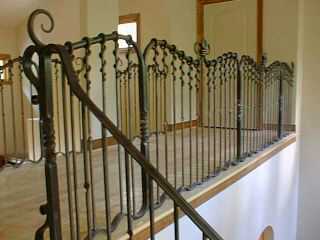 Both sides of the the "cat walk" feature this heavy forged iron rail. These photos were taken by Enrique, he's one Proud Pappa/designer. I've got quite a few photos of the job in progress that I'll post at a later date in the Process section.